MOPITT is an instrument flying on NASA's Earth Observing System Terra spacecraft, measuring tropospheric carbon monoxide (CO) on the global scale. MOPITT measurements enable scientists to analyze the distribution, transport, sources and sinks of CO, a trace gas produced by methane oxidation, fossil fuel consumption and biomass burning. MOPITT has been operational since March 2000. MOPITT Version 8 Level 2 and Level 3 products are now available for the entire MOPITT mission. MOPITT V8 products for data acquired after March 11, 2018 are considered to be provisional ("beta"), subject to recalibration, while data taken before this date are considered archival quality. MOPITT Version 7 Level 2 and Level 3 products are also available for the entire MOPITT mission. Generally, V8 and V7 Level 2 and Level 3 products should become available between three weeks and two months after the actual observations; this data latency is the result of the dependency on the MERRA reanalysis. Version 6 Level 2 and Level 3 products were discontinued as of September, 2017. See Data Products for descriptions of the different products and status of validation. User's Guides available on the Publications page should be consulted before attempting to analyze the MOPITT products. 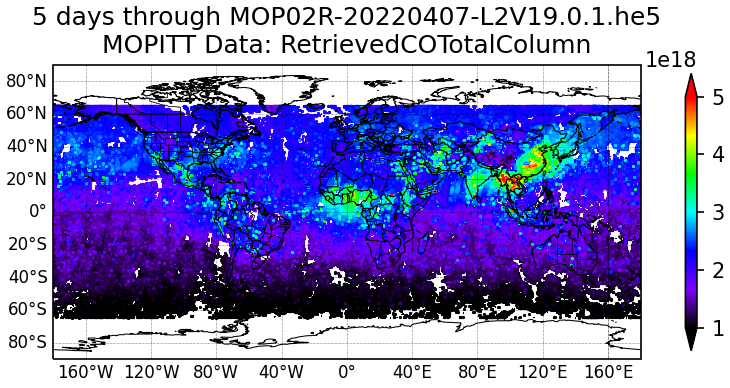 Global plots of MOPITT CO products at 1 degree horizontal resolution can be viewed for each day and month of the MOPITT mission.